Italy’s Mount Etna volcano erupted on 24th December 2018 resulting in more than 130 earthquakes of up to 4.8 in magnitude. The volcanic lava and ash spewed from a new fracture near its south-eastern crater for the first time in a decade and was visible for miles. The volcanic eruption and the subsequent earthquakes have resulted in the closure of Sicily’s Catania Airport and the Hikers were told to come down to lower elevations to avoid the noxious fumes. 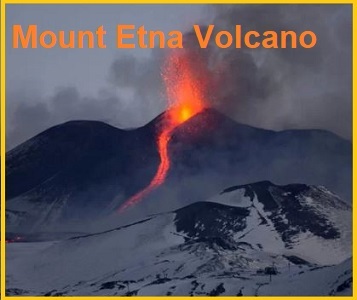 Mount Etna is Europe’s highest and most active volcano outside the Caucasus in Europe. Mount Etna is an active stratovolcano on the east coast of Sicily, Italy. The last major eruption was in 1992. Mount Etna volcano lies above the convergent plate margin between the African Plate and the Eurasian Plate. Mount Etna is in an almost constant state of activity. United Nations has designated Mount Etna has a Decade Volcano by the United Nations and it was added to the list of UNESCO World Heritage Sites. A study by the UK lead team reveals that the whole structure of Europe’s premier volcano was edging towards the sea at a rate of 14mm per year.